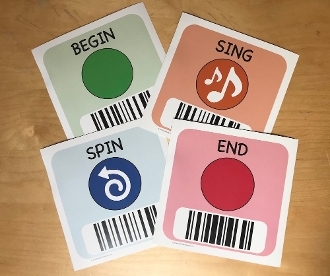 Learn KIBO's coding language through engaging unplugged play! Our "KIBO Says" game is a collection of oversized cards (8.5" square) with images of KIBO's programming icons. As they play "KIBO Says," students learn KIBO's programming language by acting out KIBO's movements, sounds, and other commands themselves. KIBO can even scan the game cards, just like the blocks!